Published: Feb. 13, 2013 at 11:36 a.m. 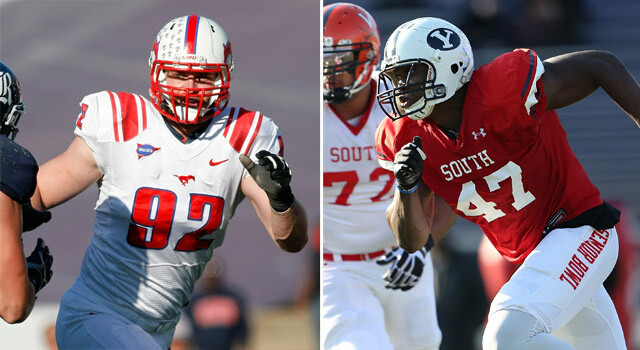 Updated: Feb. 14, 2013 at 04:52 p.m.
SMU's Margus Hunt (left) and BYU's Ezekiel Ansah are both new to football, but their versatility entices scouts. The biggest challenge when it comes to evaluating college players is accurately projecting their potential at the next level. It is easy to assess their physical dimensions, athletic traits and production; the difficult part is determining how those traits will ultimately play out on an NFL field. To increase their chances of correctly forecasting the impact of prospects, scouts routinely study the performance of top NFL players to see who is dominating the league. Additionally, they will review their old college scouting reports on these top NFL performers, to gain a better perspective on what led to their success. One player certain to be discussed in draft rooms across the league in the coming months is Houston Texans defensive end J.J. Watt. The 2012 Defensive Player of the Year emerged as one of the NFL's most dominant defenders in just his second season, leading the league with 20.5 sacks and finishing with 22 tackles for loss. Most impressively, he batted down 16 passes, completely altering the way quarterbacks throw from the pocket. Consequently, the Texans fielded the NFL's seventh-ranked defense and suffocated opponents for much of the season. Thinking back to when I evaluated Watt as a college player, I remember being impressed with his size-strength combination, high-revving motor and athleticism. Those traits certainly jumped off the tape as I watched him dominate Big Ten competition during his final season at Wisconsin. Watt routinely overpowered blockers in 2010 on the way to compiling 21.0 tackles for loss, including seven sacks. He showcased an impressive mix of strength and power while also displaying sneaky athleticism as a versatile frontline defender. Watt continued to impress scouts at the 2011 NFL Scouting Combine, checking in at nearly 6-foot-6 and 290 pounds and posting impressive results in the 40-yard dash (running it in 4.81 seconds), three-cone drill (completing it in 6.88 seconds), bench press (34 reps) and vertical jump (37.0 inches). Those are impressive measurements for players at many positions, but they were particularly so for a defensive end with exceptional bulk and length. The Estonia native, who originally came to SMU as a highly decorated track athlete (he won gold medals in the shot put and discus in the 2006 World Junior Championships), has developed into a dominant defender. In just his fourth season of organized football, Hunt amassed 11.5 tackles for loss, eight sacks and an interception. While those numbers don't necessarily jump off the page for a pass rusher, the fact that Hunt has shown exceptional strength, power and hand skills leads me to believe he has the potential to be a disruptive force as a pro. That opinion was certainly validated when I watched Hunt work out at the Senior Bowl. Although he struggled at times in one-on-one pass-rush drills, Hunt routinely flashed during team periods. And his ability to collapse the pocket is what coaches covet in five-technique players. Additionally, he displays outstanding first-step quickness on inside moves. Hunt routinely slips past blockers on slants and games to harass quarterbacks in the pocket. With an 82-inch wingspan and an impeccable sense of timing honed through blocking kicks on special teams (he piled up a whopping 17 blocks over his SMU career), Hunt can develop into a disruptive fly-swatter at the line. As a run defender, Hunt's combination of size and strength makes him immovable at the point of attack. When he plays with proper pad level, Hunt overwhelms blockers with his explosiveness, utilizing superior arm strength to quickly shed and disengage. Additionally, he shows the ability to chase down ball carriers from the backside. Hunt's motor, relentlessness and athleticism make him a threat to take over the game at any time, a trait that will endear him to coaches and scouts across the league. Given Hunt's impressive physical dimensions, athleticism and potential, he certainly will intrigue teams looking for a difference maker, despite his limited football experience. The Ghana native has been one of the hottest names in scouting circles since the middle of the season, when he emerged as a force on BYU's tenacious defense. Ansah recorded 62 tackles, including 13 tackles for loss and 4.5 sacks, while playing a myriad of positions (end, tackle, nose tackle and outside linebacker) for the Cougars. Those feats are remarkable when factoring in his limited experience (just three years of organized football) and unrefined game. Ansah's production is a testament to the immense talent and athleticism that have led some scouts to compare him to Jason Pierre-Paul. Ansah (6-5, 274 pounds) is a former walk-on track athlete with a 21.9-second 200-meter time in his background. That is a phenomenal time for an athlete of his size, revealing his overall athleticism and explosiveness. On the football field, Ansah showcases those abilities as a dynamic pass-rushing threat off the edge. He overwhelms blockers with first-step quickness, yet also shows the capacity to turn speed into power. Additionally, Ansah displays a relentless motor and impressive hand skills that allow him to play with power or finesse on rush downs. Although he is still developing a sequence of moves to counter various blocking tactics, Ansah's natural ability and talent jump off the screen when I watch him on tape. The Cougars' defensive staff tapped into Ansah's disruptive skills by utilizing him at a number of positions along the line, captivating the imaginations of defensive coordinators around the NFL. As a run defender, Ansah shows exceptional strength, power and leverage. He holds the point well in one-on-one situations and against double-teams, showing the ability to work through creases and get to the ball. For a player with limited experience, Ansah boasts terrific natural instincts; he will continue to improve as a playmaker with more repetitions at the next level. Given the willingness of NFL coaches and scouts to gamble on athleticism, upside and potential, Ansah's spectacular array of skills and versatility will prompt several teams to consider him early on Day 1 of the draft. Jones' draft stock has experienced quite a rise since the UCLA product dominated the competition at the Senior Bowl. Scouts are raving about his combination of strength, power and explosiveness as a hybrid interior defender. Additionally, evaluators love his high-revving motor and relentless effort. Those traits were on full display in Mobile, Ala., but it wasn't until I started watching the tape that I could envision Jones as a disruptive player in the NFL. Jones, who is listed at 6-4, 280 pounds, played multiple positions throughout his career as a Bruin, settling in nicely last season in Jim Mora's aggressive scheme. He seamlessly floated between defensive end and defensive tackle, taking advantage of favorable matchups along the line. Additionally, Jones' ability to create pressure from the interior allowed the Bruins' explosive outside rusher (Anthony Barr) to feast on isolated matchups. Looking at Jones' game, it's apparent that his combination of first-step quickness and power is what gives opponents problems at the line. Jones is simply too quick for lumbering interior blockers to handle without assistance from the center. He complements this quickness with explosive strength, allowing him to win with power or finesse on the inside. As an outside rusher, Jones showcases the kind of gritty, blue-collar style that can wear down opponents over the course of a game. Although his frenetic energy and effort generated just 6.5 sacks during his final season at UCLA, Jones' combination of quickness, explosiveness and effort should routinely result in double-digit sacks in the NFL. Given that Jones has also displayed the capacity to play multiple spots along the line, he could become an intriguing pass-rushing threat at the next level.